"Westbrook Junior College, Class of 1938, Reunion"
Eight members of Westbrook Junior College, Class of 1938, attended their Reunion and posed for this black & white photograph taken in 1958, 1963 or 1968. 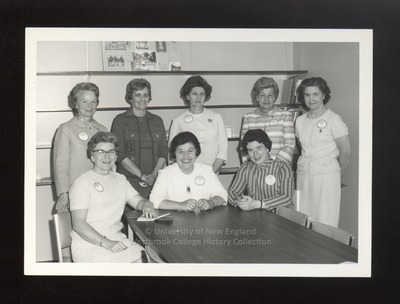 Written on the back of the photo in blue ink is: Seated - L to R - Katherine L. Sullivan, Celia Galli Mooney, Janet Lowe Palmer. Standing - L to R - Ellen Stevens Staley, Martha Cutting Bertrand, Anne Blanchard Foote, Barbara Brigham Chase, Elizabeth Alden Kerr.